When a film student from Arunachal Pradesh decided to make a film about home, his village volunteered to be the cast and crew. Yolande D'Mello reports. When 33-year-old filmmaker Sange Dorjee began work on his first film, he had his entire family, including his wife and in-laws, pitching in. “We had a little money that my dad contributed, so we tried to cut costs. I had members of my family playing the roles of drivers, cooks, cleaners, etc,” says Dorjee who screened Crossing Bridges, his first feature film at the Mumbai Film Festival. The 100-minute drama about Tashi, a protagonist who mirrors the director’s emotions, was shot in his native village of Shertukpen in Arunachal Pradesh and aims to immortalise the rich culture of the community that is eroding with time. “Young people leave the village for education or employment and then become infrequent visitors in their own home,” says Dorjee. Not much has changed in Shertukpen. The main occupation is agriculture and in the last three years, natives have taken to growing cash crops like tomatoes. Two years ago, the first mobile network tower was set up in Shertukpen, five years ago the village got electricity (it lasts for 4-5 hours a day) and in the last seven years, three schools have been built in the two villages that house the tribe with a population of 3,000. “I’m fluent in my mother tongue,” admits Dorjee, who studied in Itanagar and Delhi and then graduated from Satyajit Ray Film & Television Institute in Kolkata. The dialect of Shertukpen does not have a written script. Stories and songs must be passed on orally. “But when I sat down with the village elders, I realised that they were starting to forget the songs and there were disagreements about what the songs meant,” explains Dorjee. Other aspects are already fading even in the homeland. These include dances that last the length of the day, prayers that invoke rainfall and shamans who are taught about medicine from spirits. The filmmaker wanted to capture this “on film because it is forever”. To do so, Dorjee employed the help of the entire village, where he prepared and shot for four months. Members of the community were chosen to act, Dorjee provided the amateur actors with the situation and the actors wrote the dialogues. The director’s next film will address social issues in the northeast. According to him, the region has enough issues to feed film scripts for several lifetimes. 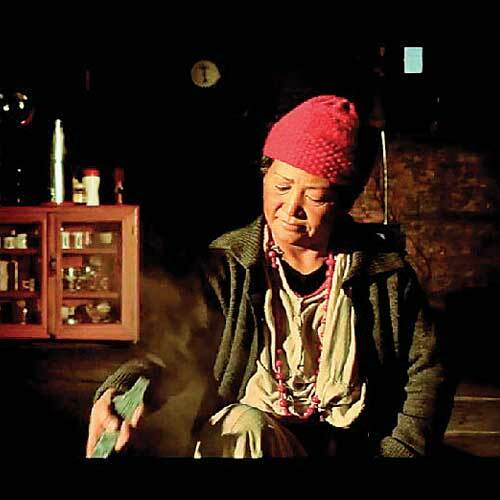 However with the current state of apathy towards issues in the region, it would be more than helpful to filmmakers like Dorjee if there was a dance to secure funding as well just like the rain dance. Crossing Bridges was shot in the hilly villages of Arunachal Pradesh using a Canon 5D. The film will be showcased at the upcoming International Film Festival of Kerala (IFFK) in December. This is the director’s first film since he graduated from Satyajit Ray Film & Television Institute in Kolkata. Sange Dorjee is also working on preparing a database of songs and folklore by recording them on film. He has identified and translated 20 such sogns and 40 stories so far.